After driving past Bean Vegan Cuisine on Route 74 for over a year and a half, I finally decided to check it out. A whole restaurant devoted to vegan food? You have my attention. I rounded up my lunch date and we embarked on a completely veggie based meal. Bean looks like it was a Mexican restaurant in a past life. The arched windows and stone bar area evoke essences of margaritas and queso. Well you’re halfway in luck…there’s vegan queso! Ambiance isn’t why you go to Bean. The tables and chairs are standard, cafeteria-esque, the lighting is a bit dim, and the curtains are nothing to write home about. You go for the food. The extensive menu explains that the food is “vegan comfort food”, which to me means delicious and plant based but not necessarily as healthy as one might think. What we found was pretty much that; the food was tasty and definitely comforting, but did contain some processed foods. I ordered the Crabbie Salad, a mixed green salad with Mega Bean mix, carrots, olives, onions, tomatoes, and Crabbie salad on top. Crabbie salad is meant to be, as the name suggests, similar to crab salad. The base is jackfruit, mixed with Old Bay, Vegenaise (vegan mayo), red pepper, and celery, served cold. Jackfruit can be dressed up in a number of ways, and this shredded crab-like preparation suited it. In my opinion, the real winner of the salad was the Mega Bean mix. Three kinds of beans, green beans, tofu, onion, and celery with a simple dressing. Can I eat this on top of every salad forever? I also had a side of the tater tot casserole, which was delightfully vegan-cheesy. 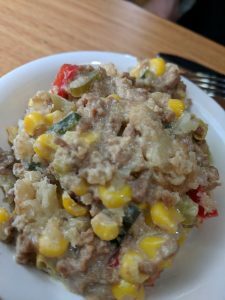 The casserole was mashed tots, corn, celery, red pepper, textured vegetable protein (TVP) “sausage”, and melted Daiya vegan cheese. The tater tot casserole definitely gets filed under vegan comfort food. My dining companion, who has a soy allergy, was able to find multiple non-soy options. 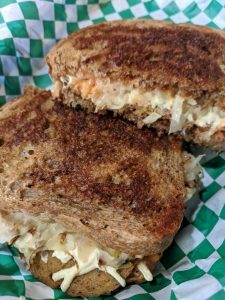 He settled on the Reuben sandwich: seitan, a meat substitute made from wheat, Daiya cheese, 1000 Island dressing, and sauerkraut on rye. Almost exactly what you’d consider a Reuben, minus the meat and not stacked as high. Seitan has a shocking resemblance to meat, which made for a perfect “corned beef”. The melted cheese paired well with the sauerkraut, and I honestly wonder if anyone would know this sandwich is vegan. He also ordered a side of collard greens. 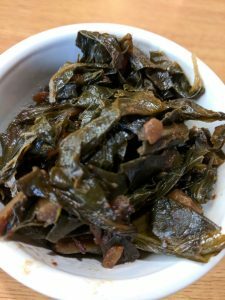 The tangy molasses BBQ sauce brightened up the cooked greens. No pork? No problem. If you’re vegan or vegetarian and don’t like meat substitutes, some things on the menu could be a little too “meaty” for your liking. However, there are options without meat substitutes, and less processed, less meaty options like jackfruit. The menu is interesting and inventive, the portions are big, and the prices are reasonable. Bean Vegan Cuisine provides what it claims to, and pleases a variety of eaters. It’s worth a visit! Caitlin Moczula is a native of the Northeast, now proud to call Charlotte home. She is discovering her new city bite by bite, and figuring out the best wine happy hours. An avid food lover, Caitlin is therefore also interested in fitness. When she’s not poking around restaurants, you can usually find her hanging out in the silks at aerial yoga. 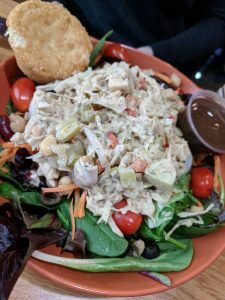 Tagged American, Casual, comfort food, dinner, Gluten Free Options, Good for Families, grocery store, lunch, market, Southern, vegan, vegan friendly, Vegetarian Friendly, veggie. Bookmark the permalink.